I often write about the benefits of being a connected educator. Today I experienced a bit of the underbelly. When I looked at my phone at lunchtime I noticed a number of twitter alerts and text messages visible on the lock screen. Texts from my son and my nephew warning me that I’d been hacked alongside DM (direct message) notices from people I don’t know (even virtually) recommending web links to me–and one from a friend asking if I had been hacked. I had a few twitter mentions from some virtual friends suggesting I change my password because they were getting DMs from me. A peek at my email showed some more messages from people I know recommending that I change my password–they too were getting DMs from me. I also got an email from Twitter telling me my password had been reset. Apparently my account had been quite busy while I was otherwise occupied with my teaching! So I spent some time resetting my password, and then responding to my friends and family to let them know that I appreciated their advice and warning. 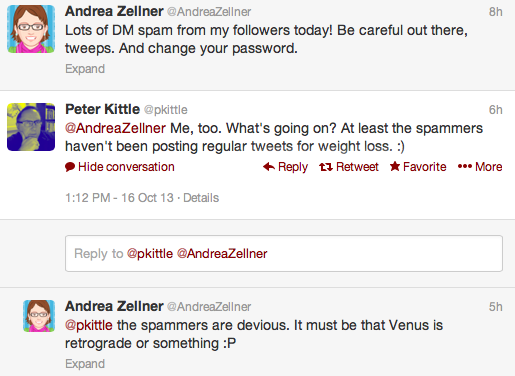 I also noticed that I wasn’t the only one victimized by Twitter spamming today. Here are a couple of other tweets pointing out the problem. I don’t like that my account was hacked or that it looked like I was sending out annoying messages to my Twitter community. But I also know that this goes with the territory. Being a connected educator means that I have to deal with the hassles of technology and social media as well as reap the benefits of it. I appreciate that my Twitter community remains cool and matter of fact even when faced with annoying and sometimes confusing security breaches…and they help me know how to act when I experience these same issues. And in spite of the problems, I remain a connected educator. This entry was posted in Connected Learning, digital tools and tagged CEM13, connected learning, hacking, learning, spam, Twitter, underbelly on October 16, 2013 by kd0602. Yep. I got one from you too. Sorry, Cynthia. I got one from Chastain. I think that started the whole ball rolling on my end. I got a hacked message from you and I have been getting other hacked messages from others too. It sadly goes with territory. But I’m sure most people knew it wasn’t you and what had possibly happened.